The stage production takes place solely in the jury room, so there are no witnesses, just the twelve jurors and the bailiff who has only one or two lines. I have seen this done though, with women playing some jurors. 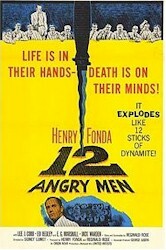 The title just becomes "12 Angry Jurors." Fabulous. I always pushed for a stage play version for our drama club as a high school thespian but I guess it didn't include enough girls except for the unflattering roles as witness. Q.How could the cast of that movie been improved? A.No way.